I went to the grocery store at least 3 times this weekend and on each trip, forgot to buy butter. Given the situation, this morning’s treat had to be made with oil. Luckily, I had some cream cheese and was able to make one of the best cupcakes I know. 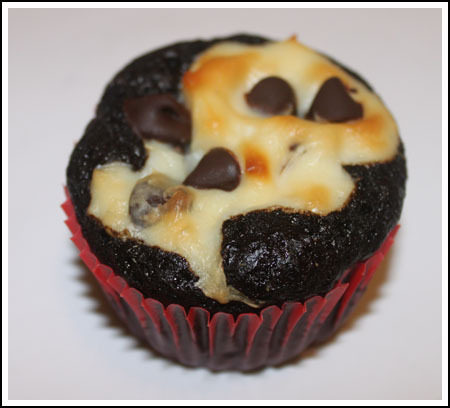 These are called Black Bottom Cupcakes and they’re like rich fudge cupcakes with chocolate chip cheesecake in the center. I had not made them in a while and this recipe (adapted from The Magnolia Bakery cookbook) was particularly good. It called for Dutch process cocoa, so I used Hershey’s extra dark Dutch which worked perfectly. The cupcakes were dense, moist, and very chocolaty. The filling was good too. It had more cream cheese and less egg than some other recipes, so the cheesecake part of the cupcake was dense without being eggy. For kicks I tried dying some of the cream cheese mixture green for St. Patrick’s Day. I mixed blue and yellow gel and got this not-so-pleasant hue (which was so awful I took down the photo), but I think if you used regular green food coloring and less of if, plus combined it with some St. Patrick’s Day themed or green cupcake cups, you’d have a prettier and appropriately festive treat. These were delicious, but I still need to try Nicole’s Baking Bites Black Bottom Cupcake recipe. A while back she adapted one from Cook’s Country that looks really good and has a whiter cheesecake filling. I keep saying I’ll try that one, then end up making the oil based version. If it’s good enough for Magnolia, it’s good enough for me! Preheat oven to 350 degrees F (175 degrees C). Line 18 muffin tins with paper cups. 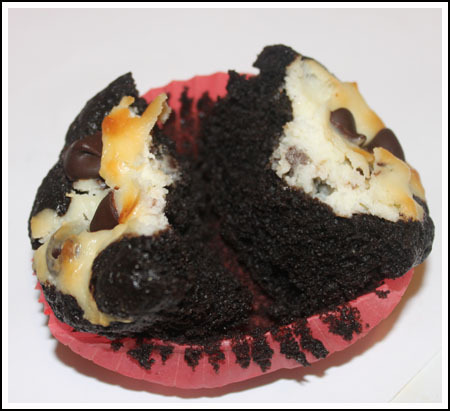 I make the black bottom cupcakes with chocolate cake mix…and it works great for bottom part of cupcake. Sounds like you used too much flour. Did you weigh the flour? The cake shouldn’t be dry, but there could be other variables, especially since you mentioned the taste was flat. Too much flour will do that (or leaving out the salt). This recipe is my favorite made as is and everybody loves it, but you could definitely try your favorite chocolate cake recipe. Let me know how it works! Hi Anna, I the Black Bottom Cupcake of Magnolia, I followed the recipe but the cupcake part came out dry, I baked mine for 28 minutes and I have an oven thermometer. I used Hershey’s Dark Cocoa. Do you think I can use my tried and true chocolate cake recipe for it? Or should I use a different kind of chocolate the taste is kinda flat with Hershey’s Dark Cocoa. Thanks. Janet, I’ve never made them as minis, but if I did I would probably take them out after 20 minutes. You might want to make a test cupcake just to be safe. My best friend from high school wants me to make these for her daughters wedding in a few weeks. She wants them as mini cupcakes. How long should I bake them? Not sure about the green in the St Patrick’s Day cupcake – although kids would love esp. little boys! Anna, most vegan cheesecakes use tofu as the base, which I don’t think would be good here. I don’t mind the actual cream cheese, just not the eggs. But yes, there must be a way to make it work without eggs, and I’m intrigued enough that I want to give it a try! LOL The green dye makes the black bottom cupcake look like it got lost in the back of the refrigerator. Cheesecake cupcakes are one of my favorite desserts! Perfect mixture of taste and perfect size. Those were the cupcakes my Aunt always made when my cousins’ had a slumber party! I gobbled those up like potato chips. Thanks for the posting that gem. I can’t believe how many of you bakers haven’t tried this recipe! I’ve been making these since fourth grade and they are delicious. So far, I think this Magnolia version is the best I’ve ever made. However, I have a batch of Nicole’s Cooks Country recipe chilling in the refrigerator and will do a side by side comparison later today. Lisa, this recipe would probably be easy to veganize if there isn’t a vegan version out there already. The cake part doesn’t have any eggs, so that makes it easier. You could use this recipe, swap out the buttermilk for some vegan milk alternative, then use a vegan cheesecake filling. I’m sure it’s been done. Cindy, along that same line — what about a mint flavored cheesecake for the filling? You could use this same filling but add a little green food coloring, some mint and mini chocolate chips. Maybe to make them Irishish you could chop up some Andes mints instead of the chocolate chips, or if you didn’t want the mint flavor, green M&M’s or what would happen if you put green sprinkles in the cream cheese??? I needed this recipe the other night. Was all set to make cupcakes and had no butter. Had everything in these, though. Made another cupcake recipe that I bet isn’t as good and now to make these, I will need to go out and buy more buttermilk. It seems I never have everything I need to make something I want to. Huh – never made black bottom cupcakes. They look really great. Are they similar at all to marble cheesecake brownies? This really speaks to me! I wonder if there’s a way to just leave out the eggs and still bind the cream cheese? I don’t think the flax substitute would work here, or look too appitizing! LOL I notice in the recipe is says 12 cream cheese. What is that? The ‘plain’ (if that is an appropriate word) look great! The green food colored ones look very healthy, like they have spinach in them. Looks beautiful and delicious. I think I can use my cheesecake brownie to make these. I recently tried a very similar recipe, but it included peanut butter in the cream cheese filling. I wasn’t a huge fan of the peanut butter w/cream cheese, but this one sounds good. Will hopefully try this recipe sometime this week! Black bottom cupcakes are one of my favorites and I haven’t made them in awhile. These look really good. I had forgotten about the Bailey’s version. I have to make something for a group on Wednesday. Maybe I should give those a whirl. I had something else in mind, but I might change gears! those look delicious!! The green swirl cracks me up, nice try 🙂 heehee It looked like spinach mixed in at first! All I can say is wow! I have never seen anything like it! Rina, thanks for the heads up on the Yoplait ad! I’ll watch for it. Speaking of which, Yoplait has a red velvet flavor. I haven’t tried it, but it sounds interesting. About the sinking, that’s happened to me in the past. I think these didn’t sink because there was more cream cheese in the recipe and less egg. My other recipe has something like 8 oz cream cheese, 1 egg and 1/3 cup sugar. Also, they specified non-softened cream cheese here so maybe that had something to do with it. Katrina, I can’t believe you’ve never tried these!!!! Try them! Nicole, I might try it with a bright or pastel colored green. That might do the trick. The other option is the Bailey’s version. I made a Bailey’s version of black bottom cupcakes a long time ago which is kind of on-theme and less tacky. These look great! I’ve never made black bottom cupcakes. Love the black bottom cupcakes, though. They’re making me crave some myself! I keep forgetting to look in the stores for that Yoplait Greek yogurt and I even just bought more yogurt. (Just making you feel better about forgetting the butter three times. 😉 I tend to do that most with eggs for some reason. I’ve never made black bottom cupcakes before but have seen them often and they look good. Love the dark chocolate look to yours. Reminds me that over Christmas I made some Oreo cheesecake squares with the red filling Oreos and well, they just didn’t look very good. Tasted great, but weren’t that pretty.